I am looking for a way to "link" an object(s) rather than copying and pasting, or "placing" in such a way that a change to the original object is reflected wherever it has been used. For example, see the screenshot (I am using artboards here, but just for this example). 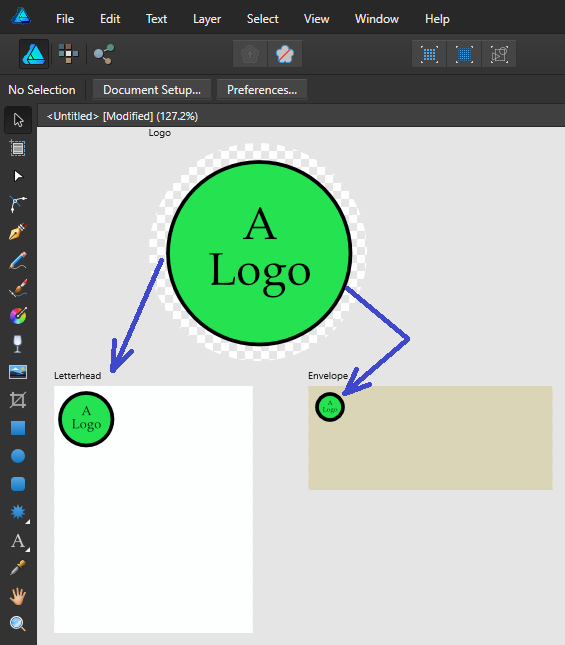 I would like to a change to the objects in the "logo" artboard to be reflected in the "letterhead" and "envelope" artboards, for example changing the text from "A Logo" to "My Logo". Is there some approach that would allow this? Doesn't have to be between artboards... logo could be a separate document, etc. Thanks... I love using Affinity Designer, and use it for all my vector based work now. Yep... that's what I needed. Hadn't investigated Symbols before... will now! Thanks!